The Masterbilt EF-500RCCE might be one of the most unique and beautiful guitars in our Masterbilt Collection. The Masterbilt Collection was first issued in the early 1930s and were the pride of our founder Epi Stathopoulo. The Masterbilt line of guitars marked Epiphone’s arrival as one of the great acoustic designers and builders of the era. That same spirit for innovation and making timeless designs is still our mission and you'll know it after you've played an Epiphone EF-500RCE which features the classic "orchestra" body shape with a generous cutaway, a Solid Cedar top, and a mahogany "V" style neck perfect for fingerpicking, and the eSonic2 pickup system. As with all Epiphone guitars, the EF-500RCCE features Epiphone's Limited Lifetime warranty and is backed by world famous 24/7/365 Gibson Customer Service. You deserve the best. Make the best music of your life with a Masterbilt EF-500RCE today at your Authorized Epiphone Dealer. Though modern building techniques may have improved the longevity of our Epiphone Masterbilt guitars, the fundamental design, materials, and workmanship that made Masterbilts superb instruments are still here and can be heard in the Masterbilt EF-500RCCE, a 'singer's guitar' with a clear and balanced tone, great projection, and natural warmth that is perfect for fingerpicking. 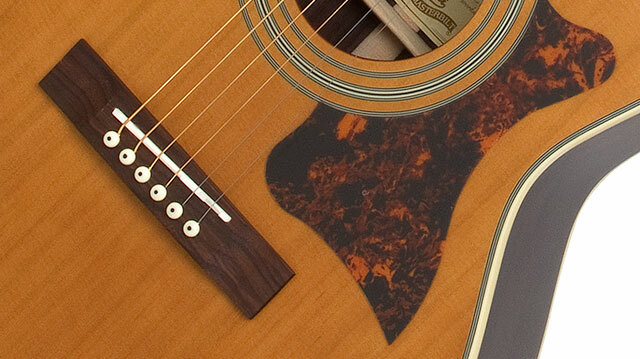 When it comes to acoustic guitar tone and quality, nothing performs better than an all-solid wood instrument. The Epiphone Masterbilt line celebrates the best of Epiphone's heritage by combining traditional construction methods and features with premium all solid tone woods to bring you a "vintage" instrument that is affordable but durable enough to last a lifetime. Epiphone luthiers of the 1930s would recognize the unique sound and feel of their original instruments brought back to life in our Masterbilt Acoustic Collection. New Epiphone Masterbilts also benefit from the consistency that climate-controlled factories provide as well as the knowledge we now have about what made those classic instruments sound so good. We put that knowledge into the entire Masterbilt line. While many other guitars in this price range use pressed backs, spliced neck joints and even artificial wood backs and sides, you can be assured that every Masterbilt holds true to our all solid wood promise. We know Epi would be proud to have his name on such a 1st class instrument. 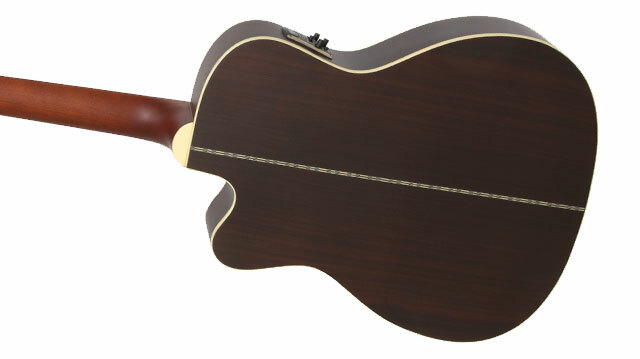 The EF-500RCCE features a Solid Cedar top, hand-scalloped Sitka Spruce braces and a bone saddle. One of the great attributes of a Cedar top is that its complex tone character gets better with age much more quickly than Spruce tops. So play your EF-500RCCE a lot! The EF-500RCCE's classic shape and elegant cutaway will inspire your imagination. The EF-500RCCE has solid back and sides which adds to this guitar’s legendary tone as well as a hand-shaped solid Mahogany neck with a 25.5". The neck joins the body at the 14th fret and is adorned with carefully cut pearloid fretboard inlays. The historic "off-set" headstock features a "stickpin" headstock inlay along with a 1.75" bone nut. Players looking for vintage tone and vibe will appreciate the handcrafted dovetail neck joint seen in all classic '30s era acoustic guitars. While the EF-500RCCE sounds great "unplugged," it really comes alive when plugged-in, thanks to the new eSonic2™ preamp system. 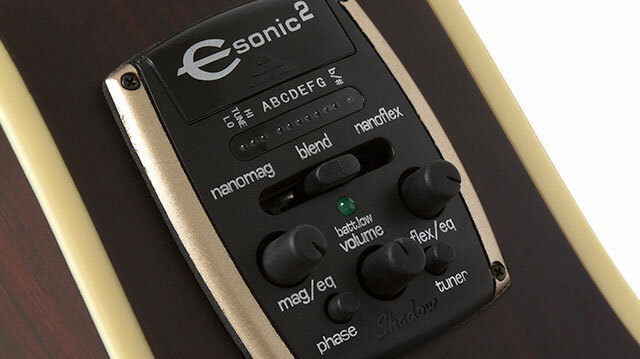 Made in cooperation with Shadow Germany, the new eSonic2 preamp features a built-in, easy-to-use tuner. When engaged, the guitar's output is automatically muted with no "popping" noise, making it a perfect choice for stage use. You can even push in the "tuner" button and unplug the guitar without a loud "pop." Other controls on this state-of-the-art preamp include Master Volume, NanoFlex ™ Tone, NanoMag™ Tone, Stereo Blend, Low Battery indicator and a Phase switch to help eliminate unwanted feedback. The preamp uses two 2032 lithium watch batteries that are not only lightweight, but provide significantly longer life than old-fashioned, heavy 9V batteries. Under the bone saddle is Shadow's proprietary NanoFlex ™ low-impedance pickup. Unlike a harsh piezo like you'd find on budget models, this unique flexible sensing material features integrated active electronics that not only can pick up string vibration but also top and body vibrations as well for a truly acoustic tone not possible with piezo pickups. Complimenting the NanoFlex is the revolutionary NanoMag ™ pickup mounted at the end of the fingerboard. Exclusively from Shadow, the NanoMag features 3 Samarian-Cobalt magnets and an integrated active circuit to capture all the highs and lows, including a wide range of harmonics. With your choice of either 1/4" mono output blending both pickups or 1/4" stereo output splitting the two pickups, you have incredible flexibility and opportunities to create the perfect acoustic tone live. The EF-500RCE Masterbilt includes quality vintage-style gold Grover® Sta-Tite™ 18:1 ratio machine heads, a bone nut and saddle, a tortoise style teardrop pickguard, gold hardware, and a bound body, neck and headstock. 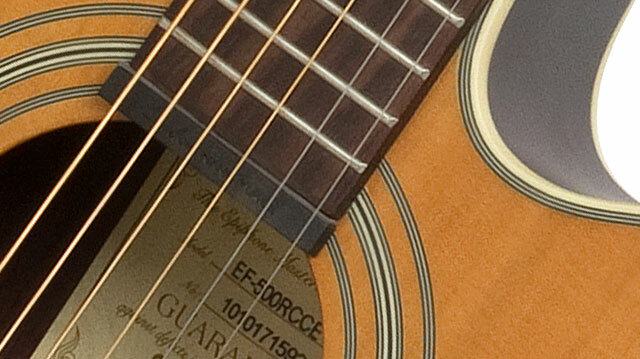 The EF-500RCCE comes in Natural Satin (NS).